It’s been quite some time since the iPhone 5s has been launched, but this doesn’t mean that it has become obsolete as a smartphone. It still stands strong, even though its younger sibling, the iPhone 6, has all the attention now. Keeping up with the times means that you should definitely take care of your device, even though its getting older. The LifeProof Nuud 5s waterproof case is one accessory an Apple user should definitely consider in buying. Check our review if you aren’t sure if the LifeProof Nuud 5s case is worth buying, or scroll at the bottom of the page if you have problems figuring out how Removing LifeProof Case works. Well, scroll down, and let me show you the magic of the Nuud LifeProof! The LifeProof Nuud Iphone 5s model is currently $80.99 on their official website, down from $89.99. It’s shockproof, so if you’re nicknamed Miss, or Mister Butterfingers, then you can drop it from 2 meters, and your iPhone 5, or 5S will survive the drop. The Nuud case is compatible with iPhone 5, and iPhone 5S. There is no LifeProof Nuud screen protector as in the previous models, so you don’t need to worry that you’ll be sacrificing the feel you get from directly playing on the touch screen. Note, that this doesn’t mean it’s less safe. The LifeProof Nuud sits tightly wrapped around your device. To be honest, being able to feel the touch screen with your fingers is the pinnacle of waterproof cases. It feels really satisfying to be able to touch the glass, knowing that if you drop it in the sink while the water is on, you won’t be crying afterwards. Also from LifeProof, you can get Fre cases, but they have a screen protector. What I’m trying to get at is, that both the LifeProof Nuud 5s case, and the Fre one are equally as thick, measuring just about 5.45″ x 2.65″ x 0.56″, or 138.43 mm x 67.31 mm x 14.22 mm. It weighs just about 1.41 oz, that is 40 grams, which means that it won’t put a whole lot of additional weight in your pocket. 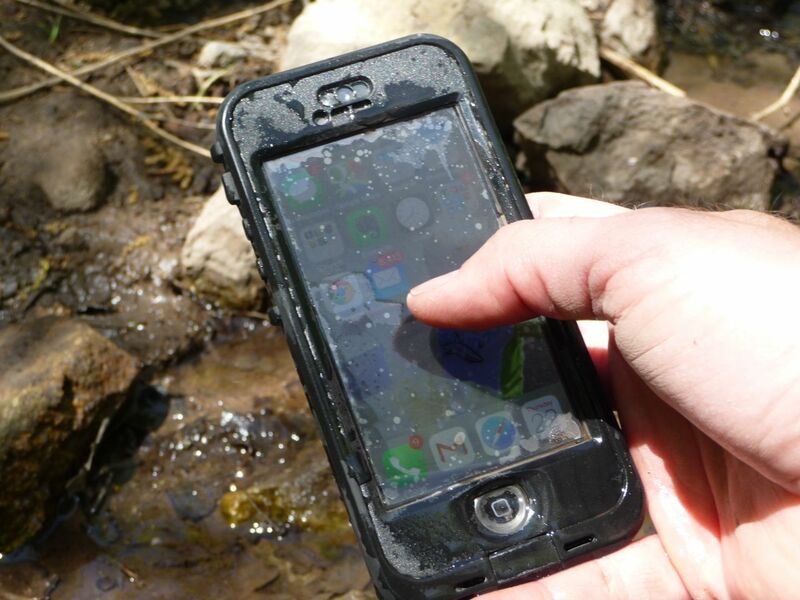 The LifeProof Nuud 5s case repels water superbly well, and it’s more efficient that any other plastic-screen cover. It’s because the oleophobic coating on the glass that also makes your screen easily cleaned – in fact, I found it better than Apple’s screen. There are absolutely no problems when swiping from bottom to top, from left to right, or diagonally. Although it creates this little bezel that encompasses the edges. iOS 8, and the upcoming iOS 9 don’t seem to have a problem with it. If you buy a white LifeProof case iPhone 5 for your Black model device, it will make it look like you’ve bought a white one. It’s definitely not a deal breaker, but it’s worth noting for those who want to keep their preferred phone color. The Nuud case is equipped with a rigid polycarbonate frame, and the makers stylized its textures, but just barely, to give it that grainy matte finish. Turning your iPhone 5 with its front facing down, you’ll notice the back clearly transparent, with its edges a little bit frosted, and elevated. Because it’s so transparent, it can show off the beauty of the iPhone 5, and the frosted edges will ensure no scruffy clumsy marks will be showcased if you bump your phone on the kitchen table. It’s a little bit elevated so if something happens, like dropping your phone, the back of the device won’t be scratched. This is the iPhone 6 LifeProof Nuud Model, which looks almost exactly as the iPhone 5/5s one. The LifeProof Nuud 5s waterproof case protects your primary rear facing camera so taking pictures, or shooting videos underwater won’t feel like a death sentence. Footage will either be unaltered, or slightly different from what you’ve been accustomed with – but the differences are unnoticeable, unless you go looking for them. If you plan on doing a photo-shoot underwater, you’ll notice that the current capacitive touchscreen tech doesn’t allow you to use your fingers on the screen in the camera app. You’ll need to use the volume rocker to either take a photo, or start, and stop recording. The rubberized design which encompasses the edges can mainly be noticed when you’re looking straight at the front of the device. This is where most of the grip from the LifeProof Nuud 5s case comes from. The iPhone 5s LifeProof Nuud doesn’t feel slippery when you take it out of the water, but you shouldn’t juggle with it, because you can easily lose you grip. You may think you would be accustomed to holding a slightly chubbier device, but trust me, you aren’t. At least not in the first few weeks. Pressing the iPhone 5 home button feels exactly like it should, and the LifeProof iPhone 5s Nuud case doesn’t impose, or take away the natural feeling of buttons all around the device. But what I’ve find lacking, is the clarity of the sound. Although you can easily understand people when you make, or receive calls, the bottom speaker tends to make the whole case jiggle a little bit, and it takes away from the LifeProof Nuud 5s waterproof case experience. Is The LifeProof Nuud 5s Worth Buying? Yes, yes it is. Mainly because it’s a great way to protect your smartphone from random events throughout your day. You can’t predict when you’re going to accidentally drop your phone in a small puddle muddy outside your office. All in all, the Nuud LifeProof 5s waterproof case is worth buying, even if you don’t catch it at the $80.99 price mark. How To Remove LifeProof Case? If you don’t like it, or you just want to tinker by removing the LifeProof case, you need to do so by following, religiously, these next steps. Disclaimer: You do this on your own risk, as the LifeProof cases are not designed to be opened up frequently. Do this only if you must! Step 1: You need to open the charge port door first. Once you’ve done so, on the left of the charge port opening, you’ll notice this little slot. Use it so you can open it more easily. Step 2: Now, just flip the case over. The bottom of the phone must be headed away from you, while the top of the phone must be facing your way. Step 3: Remember that slot we were talking about? Well, use a coin – see what fits first – and gently start putting some pressure on it, so you can separate the front, and the back. I can’t stress this enough. Gently! Step 4: Maintaining the phone firmly gripped in your hand, slide your fingers into the opening at the bottom of the area, just where you know the charge port door has been opened. Now, you must pop the latch. Step 5: Going from the bottom, you need to carefully, and slowly, pull the back of the case away from the front. Do not peel it like a banana or you will damage it. Keep it gripped in your hand. Do not bend it while doing so, because also, you can easily damage it. Step 6: Gently insert your fingers, and palm, between the back of the case, and your iPhone device. Gently rock back, and forth. This will successively help to release the latches on every side. Step 7: You got it from here. Now gently remove the top by peeling it away from the case at a diagonal angle. To sum up what you’ve read so far. Yes, yes they are. Beside being waterproof, they are dirtproof, snowproof, and shockproof. Yes, yes they do. But don’t expect to go your iPhone to live after you’ve scuba dived with it in your pocket. Like I said, it is dirtproof, and it does a really great job protecting your device, but if you have a mud wrestling contest – hey, I don’t judge – it won’t protect your iPhone. While it is snowproof, leaving it outside in full blown winter will definitely destroy your device. And the last item on my list is shockproof. It can resist falls from 2 meters. Nothing more. Drop it from a five story building height and it’s kaput!